As for Malady...I am actually surprised it is not being used more. With the recent buffs to penetration in season 3 it strikes me as a very powerful item. This is one that I would rather sit back and watch rather than potentially overbuff. Isn't this because Malady works opposite the penetration improvements? It is a resist reduction, not a flat penetration increase, meaning it applies first. Functionally it is much worse than penetration (except it applies to your entire team) and takes much longer to apply. Not only is it not very efficient, but it also doesn't build into anything later-game, making it an unlikely pick. We have rarely had success with ability power champions focusing on auto attacks (Kennen is one of the few). That being said, I do definitely think we could try out a full out AP auto attacker. It would certainly mess with the meta in the bottom lane...hmmm, saying that out loud reminds me that I really wanted to try that... I wonder what sort of thematic archetype would fit the role of AP auto attacker. Ideas? Uhm....You used Kennen as an example an AP that focuses on auto attacks? Not Kayle? Kayle is about as true an auto attacking AP champion as possible(though admittedly even she does less dps built ap/on hit than she does going AD). You Rioters are silly sometimes. If you really wanted a pure AP auto attacker, Kayle's kit is not that far off at all. I've actually often wondered why you guys haven't made the small tweaks that would be necessary to do that. As always feel free to check out my @RiotEzreal Twitter, as I'll always post in it whenever I post in this thread (just makes it easier to track). Oh my goodness, he's back! I'd completely forgotten about these threads to be honest. Where does one begin? What do you think was the biggest success of the S3 patch? The biggest failure? What has you most concerned right now? How is the LoL e-sports scene, and what do the pros have to say so far? When will we hear something actually substantive about lore? What color is your hair? Sweatshirts, or jackets? 1) I love the new items, it's given me a great opportunity to try out champions I haven't played in a long time. 2) Haven't seen a biggest failure yet. 3) Armor Penetration scares me a fair amount, especially Black Cleaver's Armor Reduction. 4) The e-sports scene is going phenomenally and every player I have talked to is excited. 5) The creative team is excited to make things better across the board, and they're pretty aligned with what the community wants. We just need time to do it! What was the idea behind making Talon's passive working with his autoattacks rather than his abilities? It contradicts the way his kit works. What are your thoughts about Zed? Many people find him UP. Personally, I agree with them, and I think he needs some buffs. The champion's designer wanted his Auto Attacks to have some impact on the kit and not be just a physical caster. ZED IS SUPER POWERFUL!!! He is a scarey beast. You made Sion right? When you going to fix him? Playing him AD seems to flow the most, albeit it still has glaring issues. AP Sion doesn't really ever use his E or his Ult, but AD sion uses the stun for chasing and the shield for extra survivabilty. I am assuming Sion was supposed to be an AD bruiser before AD scaling was a thing. Well, Sion was designed to be an offensive tank, however he deviated from this when players focused on his AP build. Over time we have considered making him more focused on AD, but shied away from it since it goes counter to how the majority of the community enjoys playing him. Honestly, I am not sure if we should change him into a AD focused champion at this point. You want new ways to integrate lore into the game? Well get those voice actors in the studio and start making more character interactions. Sounds like a great idea, and it is certainly something that we are moving towards. Check out Vi as a great example of this. Idk.. he feels so.. lonely. Haha, RiotRunaan would love to hear you say that. Champion interactions is something that we truly love integrating into the game, but as it is a new feature, it is not that easy getting previous voice actors into the studio to help out for such a small number of interactions. 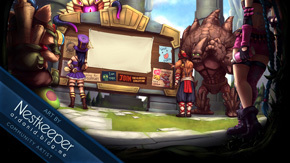 New champions will have a much easier time getting VO interaction (so hopefully we can get a new champ who interacts with EZ). I think something interesting to integrate would be chat/actions between characters. Just hidden extras for special characters when they are together based on lore. Has this ever been brought up before? It would be interesting to see sejuani and ashe argue, kha and rengar to fight together, shen and zed ninja showdown over the death of the master, yordles talking about, etc. Check out Vi, she has some awesome interactions in the game. Hey Ez, thanks for updating the thread again! What do you think about the new loss of capability for most AP Mids? The new armor penetration changes are making it so that AD bruisers scale better and offer now a better early, mid, and late game than their AP counterparts. Was that intended? Also, will there ever be a resurgence of lore, or have you guys given up on it? It was one of the roots that kept me into the game and I have realized that I know hardly anything about the new champions as I do of the old. We are investigating this. We are looking into improving some core AP itemization, as well as nerfing AD champions who are out of line in the mid lane. We absolutely have not given up on lore. We want to find new and better ways of integrating it into our game and giving it to our fans. Personally I think it adds a lot of flavor to our game, and I could deal with seeing more of it in the future. So, Ez, last time I asked you about mana shields, you kinda said they wouldn't be much good in LoL. But what if they didn't work like in WarIII? Like, ''You take % reduced damage. For each point of damage reduced you loose X points of mana.'' You know, not block all the damage and become manaless, or block all damage and be unkillable? That would work better, but then you have the problem of going oom (out of mana) while blocking damage, which is generally not too much fun. Having an ability that just blocks x amount of damage for a flat mana cost is generally more balancable and fun than an ability that can block ~ amount of damage for x + ~ mana. We have added a new mastery to help out older champions like Udyr with Kiting (the anti Slow Mastery). And we are currently looking into itemization which will help champions like this. On a different note, a concept that I always loved was that Caitlyn's "C" was actually herself, a part of her that she never knew and one that she seems unable to control, or so.. She was the one committing all the crimes, "C"aitlyn. Perhaps a more magical approach...this would be the easiest to make sense of it all. Or maybe it was created to cover up all of her crimes. But this would ruin the character. Not a possibility, is it? I have always loved that personality...and I kinda hope that it's true. But who knows, only time will tell. Wow, I'm amazed that you are willing to use some of your vacation time to reply to this thread. Thanks so much for coming back to this thread. It does not go unnoticed or unappreciated. Devotion like this really makes Riot stand out from the rest. Vacation and weekends =-P. Just gotta make it happen! Have you guys ever thought about doing a sand based champion? Like one whose abilities could be summoning quicksand to root or slow enemies, or summoning a sandstorm to reduce enemy vision (like graves smokescreen) and/or does damage, maybe with an ult that causes a mirage or has an ability to turn himself into a pile of sand to avoid damage (like vlad with his blood pool)? 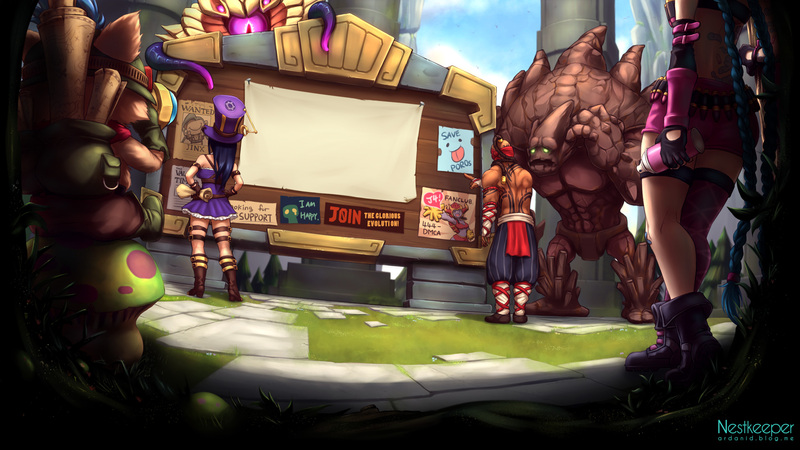 I think the concept is really interesting, and would make for a pretty cool support. Sand is one of those core elements that we haven't really explored with mages yet. Heck, I would also love to see a shadow mage some day. What are some other elemental mage archetypes that we have missed out on? I have this ult idea for a lightning/storm/electric themed assassin, and I want to know what you think of it. Summons storm clouds in an area for a duration, during this time the champ can instantly blink to anywhere within the area via a bolt of lightning. However you are limited in the number of lightning strikes, when you are out of charges the skies clear. Traveling via lightning just sounds cool. Originally my idea for such an ability was a near global range instant teleport, but that sounded like it would be really frustrating to deal with, even if I did find a way to balance it. Crazily enough we tried out both of those ideas on Ahri when she was in her development phase. The blink zone ability ended up feeling too limited, and the global dash was just OP on Dominion. Wow, that reminds me, I need to go play a couple of rounds of dominion! Urgot is pretty fun to play, but he adds a fair amount of anti fun to the game. He also encounters a few of Zileas's anti patterns, including the false choice that his acid/seeker missile creates. You think you can out distance it, but really you end up just reducing your dps while still taking a ton of dps from Urgot. Thoughts on ap kog in season 3? Haven't seen it yet, BUT I WANT TO SO BADLY!!! I'll pass it by the live team. Oh Ezreal, thy summons shall not be ignored this day! One who might fire ripples of earth through the ground resulting in long needle-like spikes impaling the target. Another option is of course ripping earth from the ground and projecting as spikeshot. Potential abilities include an effect (perhaps CC) applying after a certain amount of projectiles have hit (built up on) the target. Ricochet-style abilities are also options, as earth striking the primary target could cause additional shockwaves to nearby ones. Quicksand ripples pulsing every few seconds drawing enemies closer to him are also an option. Although be warned, the botlane meta will probably not change unless the earlygame harassment of ranged autoattacks is reduced. Otherwise you encounter the binary lane ountcome between melee and range where either A. Range dominates. or B. Melee gapcloses and wins instantly. I know that you partially helped design Shyvana, so I wanted to ask something about her. thoughts on making master Yi an hybrid champion??? is there a reason why his doublestrike doesnt refresh both on AA and with time like nocturne's passive?? could you consider to make the automatic AA after alphastrike faster?? it seems too slow and allows enemies to escape easily. why do melee carries have weak lategames compared to lategame monsters like jax or olaf or even poppy??? and the fact that there's not much difference between the damage of a ranged and melee ADC?? why do melee carries have such low priority when they have been in trouble for so long?? ?